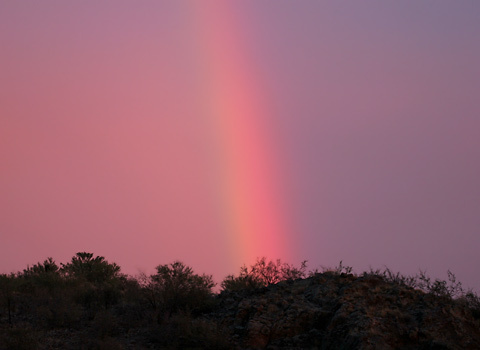 It's not too common to see a rainbow in a colorful sunset sky, but sometimes one will suddenly appear, as this one did on April 4, 2006 here in Tucson. A rainbow can be observed when low angle sunlight coming from behind the observer shines on water droplets in the air. Since the sun sets in the west, this means that for a sunset rainbow to appear, the eastern sky must be colored by the sunset, and not just the western sky as is usual. The arc of this particular rainbow faintly spanned the eastern sky, but the brightest section was to the southeast, and this small section is the one shown in the above photo. In the arc of single (non-double or triple) rainbows, red is on the top and violet is on the bottom. Since the sky too is quite colorful in sunset rainbows, the rainbow itself can be a bit more difficult to distinguish than would be an equally colorful rainbow against a neutral gray sky. Even though sunset rainbows are not the most common, I did find other photos of them on the web. In one photo, the arc of a sunset rainbow over the Atlantic Ocean can be seen behind a CH-46 Sea Knight helicopter aboard the USS Iwo Jima. In another, a lucky photographer managed to capture a sunset rainbow and lightning over Arizona's scenic Monument Valley.